Thu, Apr 25, 2019, 20:33:39 ---- The fact: 42.844.000 visitors done. T-DRILL - The manufacturer & world wide supplier of tube processing and chipless tube cutting machines have made a number of improvements and additions to their range of collaring machines models TEC-150 and S-54 in addition to the new chipless tube cut-off machine model TCC-26. With TEC-150 the T-Joining of steel tubes is made efficient and easy. Traditionally this job has been difficult and time consuming, but with the new TEC-150 the process has been rendered fast and easy, providing higher quality even automatic orbital welding equipment can be used. Features of the new TEC-150 - which will be on display at Tube Dusseldorf 2004 - include an extended collaring capability, enabling the user to form collars as large as 219 mm (8). Also on offer is the S-54 collaring machine for brazed T-joining of tubes, designed for applications including automotive air-conditioning parts, exhaust and engine cooling tubes and house/industrial air-conditioning tube joining. T-DRILL also regards the solar panel and heat pump sectors as exciting new collaring markets. For the chipless cutting of thin walled tubes T-DRILL offers the new TCC-26 model, which is especially suitable for automotive brake and fuel tube cutting. Other applications include aluminium and copper tube cutting for automotive and house/industrial air-conditioning applications. The machine is now equipped with advanced diagnostics features via a touch screen. It can also be equipped easily with NDT and color detectors in addition to ink-jet printing devices. 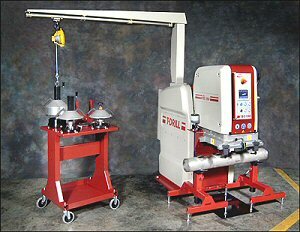 At Tube Dusseldorf T-DRILL will also introduce an inline endfinishing solution for chamfering both tube ends. The system is specially focused for the continuing operations of steel tube after cut-off. T-DRILL will be exhibiting at Tube Dusseldorf on stand 4 A 56.